Some at Chelsea have been given cause for concern as Willian is already five days late for his return to pre-season with the club amid transfer rumours linking him with a move away. 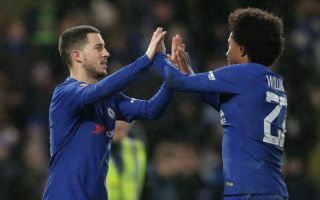 The Brazil international has been the subject of much speculation this summer, and the Times claim some at Stamford Bridge remain concerned about his future amid interest from Manchester United and Real Madrid. The report also states Willian’s late return is due to passport problems, but it’s not an ideal start to the new campaign for the 29-year-old as he will surely have wanted to display his commitment to the cause to new manager Maurizio Sarri. It has previously been claimed by the Sun that Sarri’s appointment was unlikely to make any difference in terms of persuading Willian to stay after he’d become unhappy with life in west London under previous Chelsea manager Antonio Conte. It would be a big blow for Chelsea to lose such a quality player with so much experience as they look to improve on last season’s disappointment and make it back into the top four in 2018/19. Willian would surely be a key part of Sarri’s plans to do that, but it is perhaps unsurprising that he may have had his head turned by bigger offers as he ponders what could be the last big move of his career.